Good morning. It gives me great pleasure to welcome you all, especially those from overseas who come all the way to attend the first-ever "Mare Forum Hong Kong" 2017. 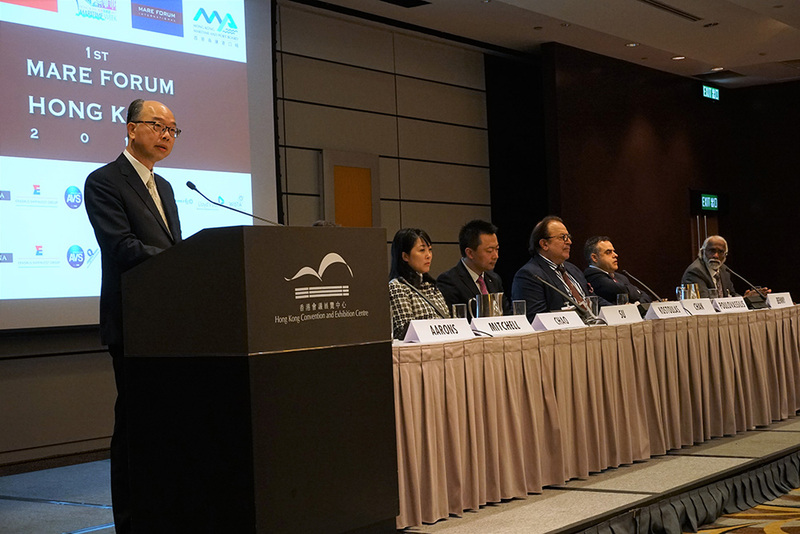 The desire to know the future is indeed human, and so is the theme of the Forum today: "Hong Kong Maritime: today to 2047 and beyond". Hong Kong is an externally-oriented economy. The business environment of our shipping industry is intertwined with international trade. Our fate are bound together for better or worse. In the past few years, our shipping industry experienced a downturn due to the sluggish international trade. Demand has been curtailed by slower growth in many markets, amid both economic and political uncertainties in many countries. But as an old Chinese proverb goes, with risks come opportunities (有危自有機). The sluggish global economy calls for more trade and investment activities across the globe, and there are new signs of improvements. This September, the WTO projected that the growth of global merchandise trade would rise from 1.3% in 2016 to 3.6% in 2017 and 3.2% in 2018, portraying a sanguine picture for the shipping industry. As a matter of fact, our shipping industry is gathering momentum. For the first eight months of 2017, the total throughput handled at Hong Kong Port amounted to 13.8 million TEUs, representing a growth of 9.0%. 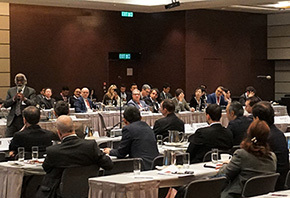 The ensuing recovery in global demand would accelerate Asia's trade flows in the near term and portrait a brighter prospect of the maritime industry, both local and global. In addition to the Belt and Road corridor, the Guangdong-Hong Kong-Macao Bay Area Development also offers immense opportunities ahead. The fast growing Bay Area, which covers Hong Kong, Macao and nine cities in Guangdong Province, is the most affluent region in China. Thanks to our enhanced connectivity through major transport infrastructure such as the Hong Kong-Zhuhai-Macao Bridge and the Guangdong-Shenzhen-Hong Kong Express Rail Link, these developments will further facilitate the flow of people, cargoes and capital in the region, and presents enormous potentials for Hong Kong and overseas businesses. Leveraging on our unique position, the advantage of "one country and two systems", Hong Kong can serve as "a hub for international trade and investment" under the Belt and Road Initiative and the Bay Area. We are pleased to connect China with the rest of the world, bringing in businesses and investments, for Mainland companies to "go global", and global companies to "go China". During the past few days, I attended various events of the Hong Kong Maritime Week 2017 and met with key industry personalities including your good selves. One of the most inspiring and intriguing topic in our exchange lies with how the shipping business and operation will evolve in the next 30 years in 2047 and beyond. The answer as to how the maritime and port industry could better equip for the challenges ahead, relies heavily upon technology and innovation. Take the Hong Kong Port as an example. Our Port is currently adopting various technologies in automated operation, including the Rail-Mounted Gantry Cranes, which are capable of searching and shuffling containers via remote computer control. Among the international maritime community, automated shipping is gaining momentum. Many years back in time, probably no one would have thought of the possibility of an "unmanned" vessel. Yet, automated shipping is going to become reality. Indeed, with lower operation costs and voyage expenses, automated shipping will certainly bring along technological revolution, and enhancement of port and vessels' efficiency. With further evolution of e-commerce, digitalization, e-navigation, the blockchain technology, and so on, the benefits of information technology would lead to further enhancement of industry performance. Value creation and improvement in business processes are also crucial to the future development of the maritime industry. Ladies and gentlemen, technologies and innovations, be it incremental or disruptive, are plenty. And it is all up to the maritime and port industry to pick and choose, with a view to controlling the industry's destiny. With this, I earnestly await for your sharing and thank you once again for your company, throughout the week long maritime journey here in Hong Kong. Thank you.